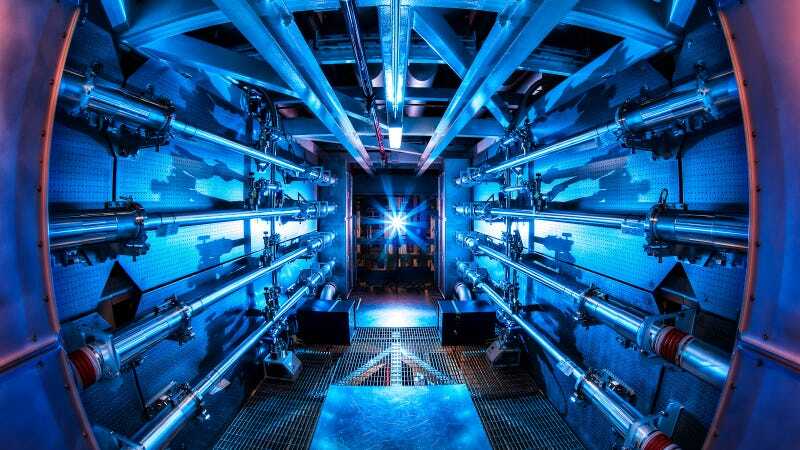 Hidden away at the Lawrence Livermore National Laboratory's National Ignition Facility is a terrifying 10-story laser. Recently scientists have finally started using it in anger, and now they've even smashed previous records to fire the most powerful laser shot ever recorded. On July 5th, the scientists fired the 192 constituent laser beams simultaneously, before focussing them down onto a circular target just 2 millimeters in diameter. The result was a laser beam transmitting an eye-watering 500 trillion watts. That's 1,000 times more than the entire United States uses at any given moment, and the highest-energy laser shot ever fired in real life.